Steampunk is a genre that many are familiar with but don’t actually know much about. They are familiar with books, movies, and designs that are based on this steampunk genre, but are not all that familiar with its origins. The term ‘steampunk’ actually didn’t come into existence until around 1987, but the genre existed well before then. For those of you unfamiliar with the term, it is a genre consisting of designs, stories, novels and movies that has taken on a history of its own. Steampunk works are usually set in a fictional time period in the 1800s, and the machines that take on the ‘steampunk’ appearance are what those living in the steam powered 19th century could have thought future inventions may have looked like. The 1950s and 1960s are when this steampunk genre really came into existence, although back then there wasn’t a specific name for it. Steampunk machines, devices, etc., usually consist of a lot of gears and analogue mechanisms. Today you see all sorts of unique designs, such as steampunk jewelry, clocks, clothing, and just about anything else that you can think of. 3D printing is a technology which has taken things to the next level, as designers can now fabricate their own unique, extremely complicated, steampunk creations. We thought we would share with you some of our favorite 3D printed steampunk designs. We’ve begun to see a lot of unique 3D printed guitars hit the market, mostly designed by Olaf Diegel and 3D printed with 3D Systems’ printers. This is our favorite design of them all. 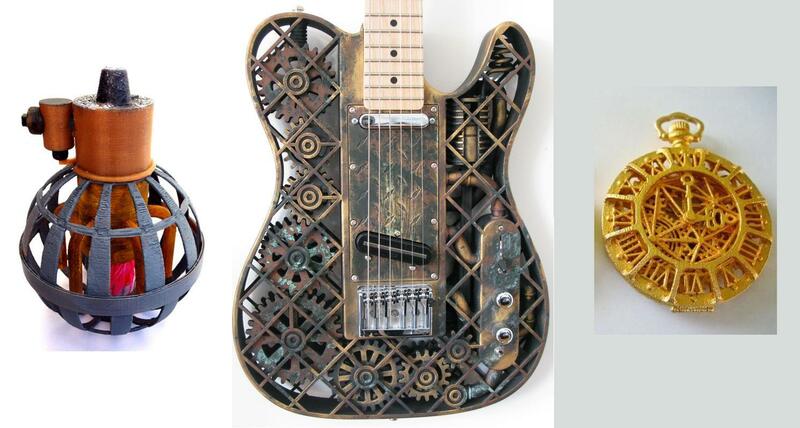 This steampunk guitar features real moving gears within the body of the instrument. Priced at $4,000, this isn’t a guitar for everyone, but might be just the perfect instrument for that musician who happens to be in love with steampunk. This 3D printed desktop toy is obviously steampunk themed. If you turn one of the 28 gears in this cube, the other 27 will follow suit. In fact, the designer, Alexander Maund has created a motor system to do the work for you. Available on Shapeways for $110, this is hard to pass up, especially if you take a liking to steampunk. 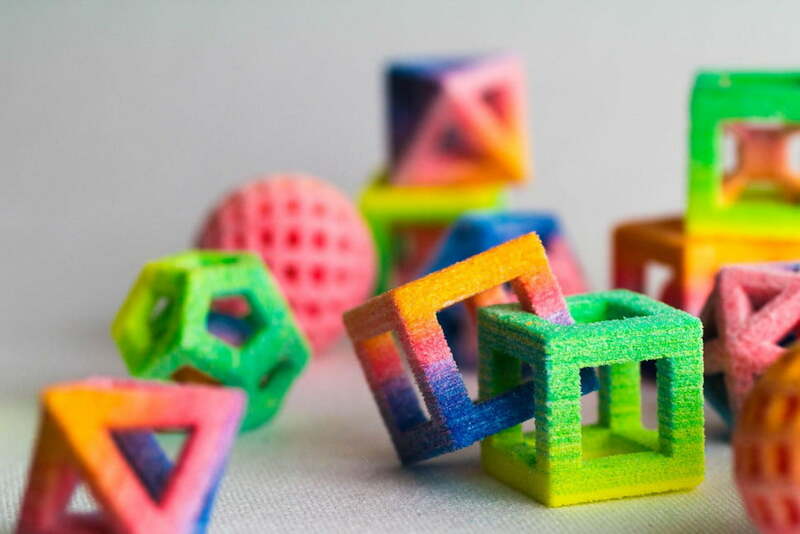 We’ve heard about using 3D printers to print out new 3D printers. It’s quite the interesting idea. 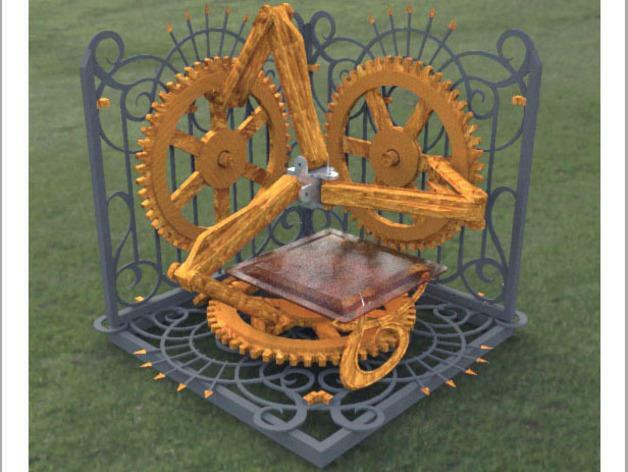 However, one designer on Thingiverse came up with the idea to 3D print a Steampunk 3D Printer. OK, maybe it doesn’t actually work, but it still looks cool. The futuristic 3D printer of the 19th century? Perhaps not. Ever imagine what a futuristic hand grenade might look like to a designer in the 19th century? Well, Reg Taylor certainly did. 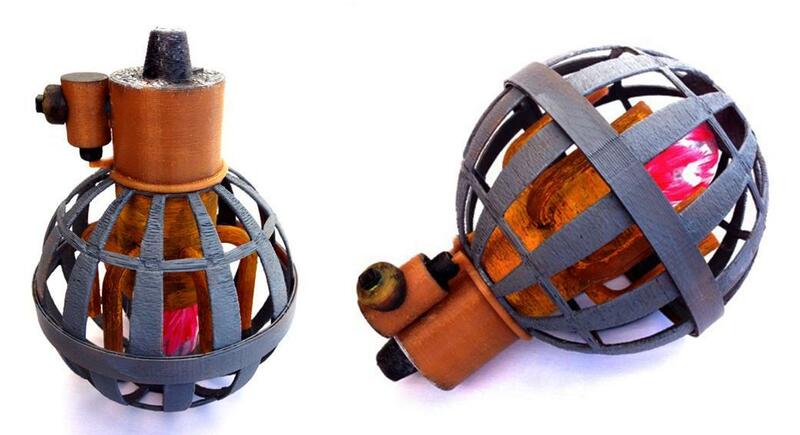 He designed and 3D printed this incredible steampunk grenade in his free time. Of course it’s not actually a working grenade, but it certainly looks like it could be. It uses a 12v car bulb in the base, but Taylor suggest that perhaps it could be improved upon by adding in LEDs. 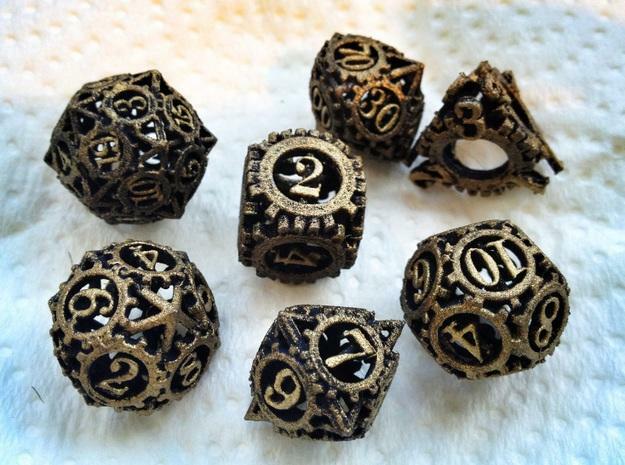 Shapeways is full of 3D printed dice, but perhaps none as unique and interesting as this creation by designer Seth Alexander. Alexander makes this dice set available in a variety of metals and plastics, ranging in price from $21.98 for a plastic version up to $107.42 for the gold steel dice set. 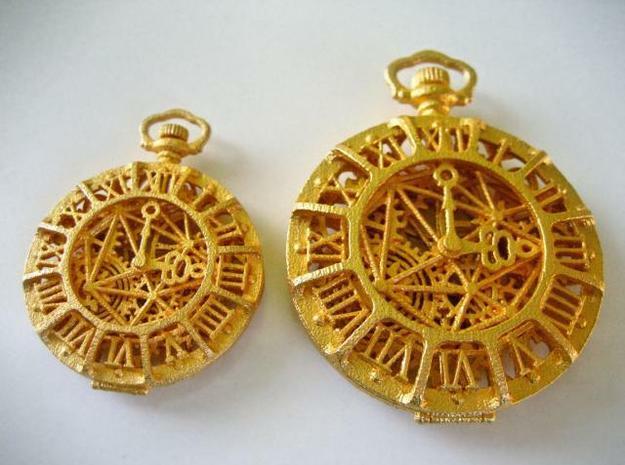 This is a non-working time keeper pendant, created by 40 West Designs. “It commemorates a birth date, an anniversary, or any other significant moment in your life, in history, or the future. 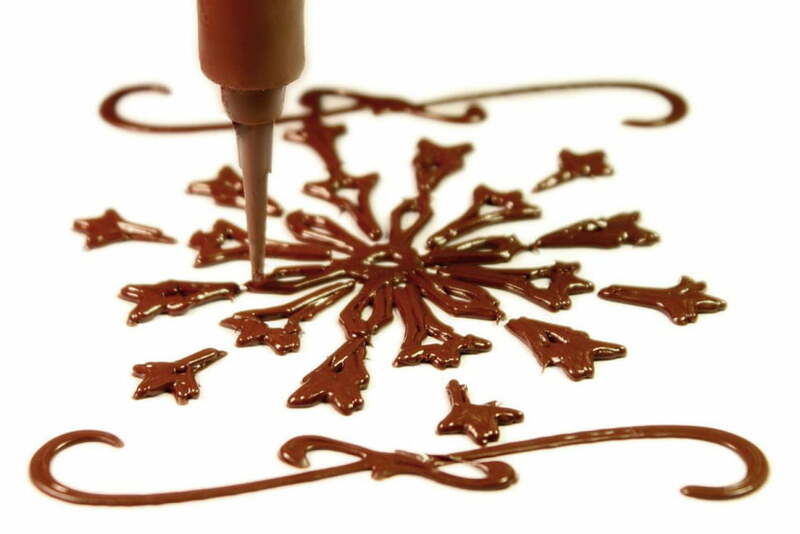 It will keep that time with perfect accuracy, forever,” explains the designer. “You set the date and time. You can also include a short message below the date.” Available, starting at $74 on Shapeways, this is quite the gift for the steampunk lover in your family. This is probalby our favorite of them all. 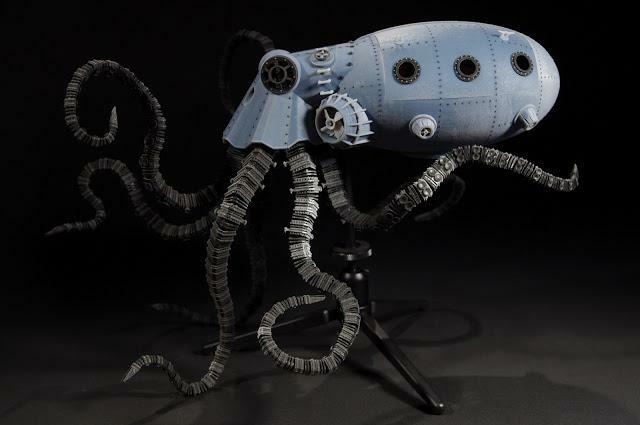 It is a 3D printed mechanical octopus vehicle, that includes working features and LED lights. The panels on the sides are held on with magnets and can be removed at will. The door latch is fully functional and the LED switch is hidden inside. It has an operational hoist that moves back and forth and can turn. Well there you have it, our top 7 3D printed steampunk designs. Which are your favorites? Discuss in the 3D printed steampunk forum thread on 3DPB.com. Educate Yourself About the Upcoming Revolution in the World of Manufacturing! 3D Printing: Are You Ready for the New Decentralized Industrial Revolution? THE WORLD AROUND us has advanced so much that science fiction is no more a fiction. Moving from prototyping to tooling, additive manufacturing commonly known as 3D printing has expanded to full-scale end-part production and replacement part production. 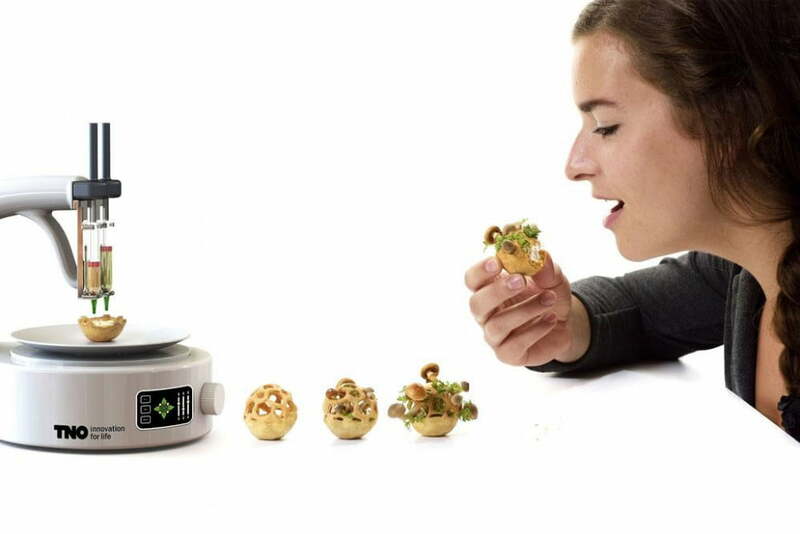 Be it a 3D printed bionic ear enabling you to hear beyond human hearing frequencies, 3D printed cake toppings taking the culinary innovation to another level, 3D printing your dream house in just a few hours — 3D printing is revolutionizing every walk of life. According to Wohlers Report 2014, the worldwide revenues from 3D printing are expected to grow from $3.07 billion in 2013 to $12.8 billion by 2018, and exceed $21 billion by 2020. No wonder one of the biggest players in printing, HP (Hewlett-Packard), entered the field with a faster, cheaper version of 3D Printer focused on Enterprise Market. So is this the first step from a “revolutionary” Maker Movement to an Industrialized Scale that technology eventually needs to survive for the long term? To a world of taking a 3D physical product or an idea to the Digital World, which happens to be 2D and then back out to 3D physical form anywhere across the globe, where an IP address and enough bandwidth is available to be able to transmit the Digital Model. This does have significant disruption potential. How much and when this will happen will of course depend on several factors across economics, technological feasibility, policies and of course politics. So are we finally ready to go beyond the growth that the DIY enthusiasts have driven from 200% to 400% in personal 3D printers between 2007 and 2011 according to a McKinsey Study. Before we pose those questions, let’s look at what has been already achieved or near achievement across markets beyond printing prototypes, toys and models. In the field of medicine, 3D printing of complex living tissues, commonly known as bioprinting, is opening up new avenues for regenerative medicine. With an improved understanding of this technology, researchers are even trying to catalyze the natural healing mechanism of the body by creating porous structures that aid in bone stabilization in the field of orthopedics. This cutting edge technology in conjunction with stem cell research is likely to revolutionize the made-to-order organs, cutting across the transplant waiting lists. Even intricate human body parts like the brain can be replicated using the 3D technology to aid in complex medical surgeries through simulation. The Aerospace industry, an early adopter of this technology, is already designing small to large 3D printed parts saving time, material and costs. 3D printing also offers the biggest advantage critical to the aerospace manufacturers – weight reduction. It also accelerates the supply chain by manufacturing non-critical parts on demand to maintain JIT (Just-in-time) inventory. The power of additive manufacturing can do away with several manufacturing steps and the tooling that goes with it. The Automobile world is already witnessing crowd-sourced, open-source 3D printed vehicles driving off of the showroom floors. Local motors caught the audience by surprise by 3D printing its car ‘Strati’ live at the International Manufacturing Technology Show (IMTS) in Chicago. So how can an auto part be a challenge by any means? Are we headed towards making that exhilarating smell of burnt rubber a thing of the past? Something future generation will ask, what the big deal about that was? How about robots with muscle tissue powered parts? The 3D printed “bio-bot,” developed by the University of Illinois at Urbana-Champaign, is likely to be really flexible in its movements and navigation. (So, forget about the much jibed about robotic movements.) With this breakthrough, researchers are contemplating on the possibility of designing machines enabled with sensory responding abilities to complex environmental signals. The excitement growing around the 3D technology is palpable and rightly so not without a reason. 3D technology surely shifts the ownership of production to the individuals and brings to light most of the inefficiencies of mass-production. Of course, not everything can be 3D printed, but a wider use of 3D printers might reduce need for logistics as designs could be transferred digitally leading to a decentralization and customization of manufacturing. 3D scanning as an enabling technology will also help in creating an ecosystem to support users. The layer by layer manufacturing by 3D printing has the dexterity to fabricate intricate geometries efficiently and hence reduces the wastage caused by traditional manufacturing methods. By reducing the cost and complexity of production, 3D printing will force companies to pursue alternate ways to differentiate their products. It will also help companies enhance their aftermarket services by facilitating easy on-demand manufacturing of replacement parts. As manufacturing is moving closer to the consumers, the consumer is fast transforming into a prosumer. There are, of course, hurdles to overcome, not the least entrenched incumbency and policies, which will be governed by more short term economic and social impacts as the positive outcomes of such revolutions are often difficult to envision. McKinsey has estimated a potential of generating an economic impact of $230 billion to $550 billion per year by 2025 with various 3D applications, the largest impact being expected from consumer uses, followed by direct manufacturing. As the breadth of application of 3D printing continues to grow, it will be interesting to observe how the industries will mix with and influence the future of additive manufacturing. Almost every sector of the industry is riding on the 3D opportunity bringing innovations to reality and the world is ready to hop on to a decentralized industrial revolution. Are you? 3D printing has captured a lot of attention thanks to its science fiction connotations. In reality, 3D printing is anything but fiction since it’s available in many households – even as a sophisticated toy for kids. Clearly, 3D printing is more than a passing curiosity, and with researchers from Princeton now able to create “bionic” body parts using 3D printing techniques, the world’s first bionic man may be here sooner than you think. As part of a project demonstrating new 3D printing techniques, Princeton researchers embedded tiny light-emitting diodes into a standard contact lens, allowing the device to project beams of colored light. The researchers have not developed this lens for human use in the eye, but it is part of an ongoing effort to use 3D printing to assemble diverse, and often hard-to-combine, materials into functioning devices. Princeton professors also created a bionic ear made from living cells with an embedded antenna that could receive radio signals. Thus, restoring a person’s hearing for the first time. This sends me back to my childhood to Steve Austin and the TV series “The Six Million Dollar Man” where a former test pilot is rebuilt with nuclear powered limbs and implants that make him faster, stronger and better than normal. Traditional manufacturing methods depend on cutting and molding technologies to create a limited number of structures and shapes, with more intricate hollow ones formed from a number of parts and assembled together. However, 3D printing technology transforms this process—the nozzle of the 3D printer can create many complex figures, being confined only by a person’s imagination. The use of 3D printing technology takes virtual designs from animation modeling software or computer-aided design (CAD), converts them into thin, virtual, flat cross-sections and then produces successive layers until the complete model is produced. For the Princeton researchers, one of 3D printing’s greatest strengths is its ability to create electronics in complex forms. Unlike traditional electronics manufacturing, which builds circuits in flat assemblies and then stacks them into three dimensions, 3D printers can create vertical structures as easily as horizontal ones. Manufacturing experts do not envision 3D printing replacing traditional manufacturing in electronics any time soon. Instead, 3D is seen as a complementary technology. Traditional manufacturing is a fast and efficient way to make multiple copies with high reliability. Manufacturers use 3D printing, which is slower when it comes to higher numbers of copies, but easy to change and customize, to create molds and patterns for rapid prototyping. Blinking contact lenses and bionic ears are two perfect examples that may sound weird in the beginning, but show that the work of interdisciplinary R&D teams using latest technology can result in true innovation – and generate new use cases that one has not even dreamt of before. With all the talk in the press about enhanced robotics, the internet of things and systems engineering, I think we can soon rebuild Steve Austin. 3D printers don’t already fall somewhere on your list of the top ten coolest things ever, then you really need to take some time to rethink your priorities. The following list of eight unbelievably awesome things that 3D printing is already being used for should help to convince you (if you need convincing) that 3D printers are science fiction come true. With a prosthetic leg created by designers at 3D printing company 3D systems,Derby the disabled rescue dog (warning: if you’re pregnant, menstruating, or a passionate animal lover the aforementioned link will probably make you cry) recently got to run for the first time. Derby’s leg was designed by an artificial limbs specialist, who worked along with Derby’s adoptive parents to model and print Derby’s new legs. Researchers advocating the far-reaching potential of 3D printing recently used aRepRap printer to create self-adjustable glasses. The glasses cost just $1 to produce, and the lenses can be self-adjusted, helping low-income families to avoid the costs normally associate with vision correction. The project demonstrates the humanitarian implications of 3D-printing. With 90% of visually impaired people living in countries where corrective eye-care is either impractical or impossible, the Adspec glasses could have a huge global impact. How cool would it be to print your own furniture? 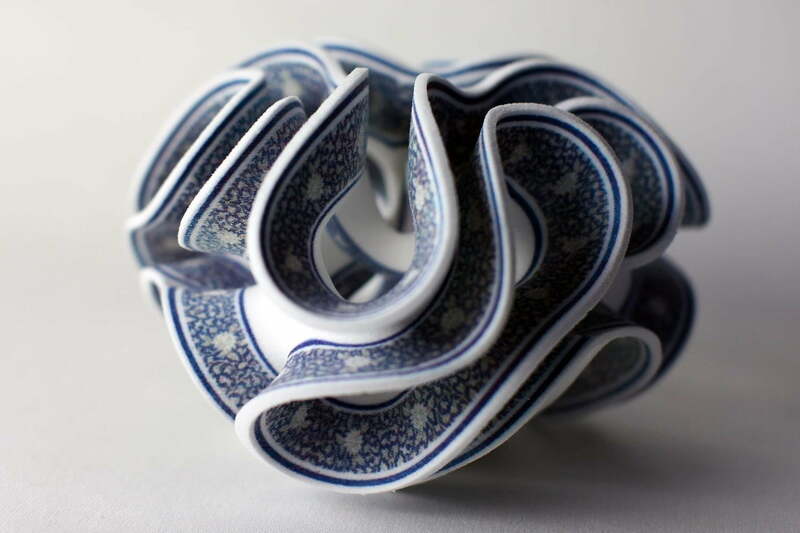 With 3D printing, it could be a real possibility. Already, designers have begun experimenting with 3D furnituremodels, producing some pretty neat results. Imagine how much easier moving into your college dorm room would have been if all you had to bring was your 3D printer! Already, 3D printing has had a huge impact in the medical field, but its most exciting application is still in the works. 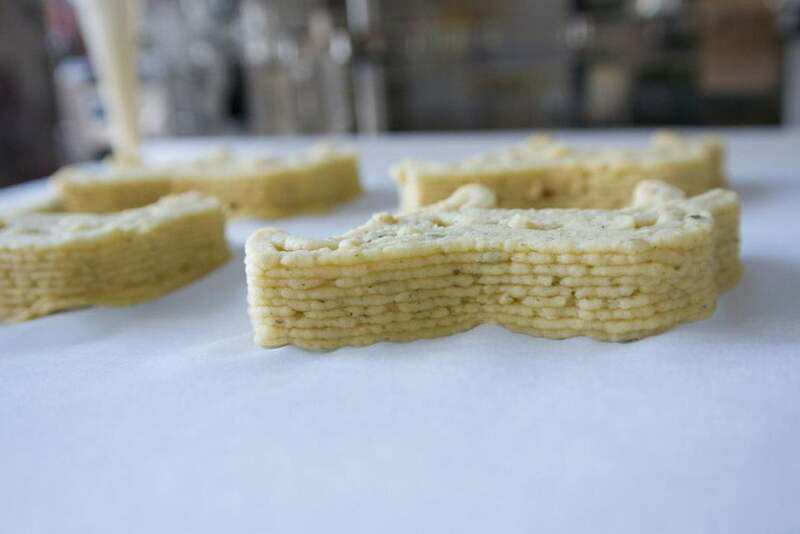 Scientists all over the globe are in the race to create the first fully-functional human organ using 3D bio-printing. Bio-printing combines traditional 3D printing methods with stem cell “ink,” creating delicate structures such as human capillaries with an ease that conventional manufacturing methods could never hope to achieve. Already, prominent scientists such as Anthony Atala have begun creating organ prototypes that could feasibly solve the growing organ-donor problem within the next decade. WinSun Decoration Design Engineering, a company in China, has used a giant 3D printer to create ten single-story homes. An environmentally-friendly project, the houses were constructed out of construction waste and glass fiber. Although the buildings only measure 10 x 6.6 meters, the project has laid the groundwork for 3D building, a development that is well on its way to revolutionizing the construction industry. 3D printed jewelry is already on the market, and it’s surprisingly affordable. By using 3D printers, jewelry makers can produce intricate designs in half the time, using precious metals as well as plastic and brass. This 3D printed jewelry is an art form in its own right, creating geometrically modern custom designs that are already growing popular amongst consumers around the globe. 3D printed clothing has hit the catwalk in recent years, and may soon revolutionize the fashion industry. Although 3D-printed clothing is somewhat materially restricted, it makes ordering perfect-fit clothing easy and affordable. With companies like Australia’s XYZ Workshop already offering downloadable dress designs, soon anyone with a 3D printer will be able to manufacture their own clothing at home. Non-profit 3D printing firm Defense Distributed has created a series of fully-functional gun components using 3D printing methods. All of the blueprints are available for free through the Defense Distributed website, so if you have a 3D printer at home (or if you plan on buying one now that you’ve discovered how awesome they are), you can make your own 3D weapons.